REVIEW | Rare's pirate adventure sets out on its maiden voyage. How does the Pirates of the Caribbean song go? Yo ho, yo ho, a pirate's life for me. We pillage plunder, we rifle and loot. Drink up me hearties, yo ho. We kidnap and ravage and don't give a hoot. Drink up me hearties, yo ho. I'm not sure this applies to me. While I was a fan of one pirate experience in Assassin's Creed IV: Black Flag, this new pirate's life that Rare has built in Sea of Thieves might not be my bottle of rum. 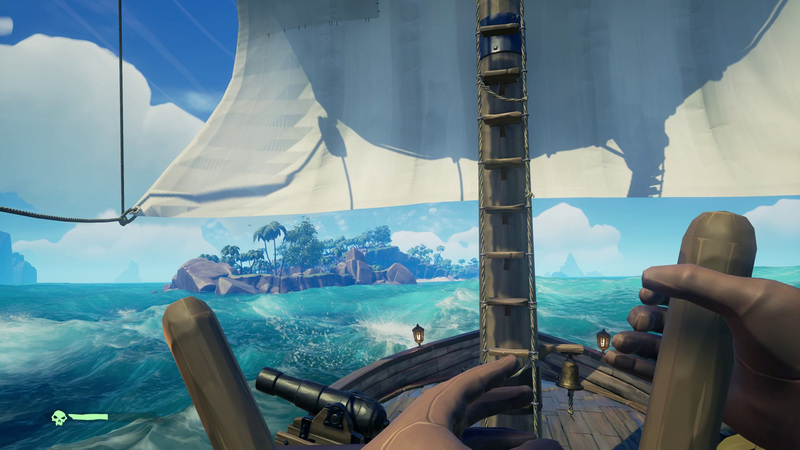 Sea of Thieves is a game that requires everything to line up perfectly in order to reach its highs, but when things aren't in alignment, it falls apart. This is Sea of Thieves at its best. Sea of Thieves is a pirate game in the purest sense. It's all about exploration on the high seas, with a navigator yelling from the crow's nest at the sight of land. It's about hunting for treasure on islands, puzzling out a map where X marks the spot before digging. It's about conquering the natural and the supernatural, with the skeletons of past pirates doing their best to protect their plunder. The core loop of Sea of Thieves involves voyages. These are essentially quests that you pick up from one of the game's three factions: the Gold Hoarders, the Merchant Alliance, and the Order of Souls. Each group offers a different type of play. The Gold Hoarders have maps to buried treasure, but it's up to you to sail to the location, figure out the map, and uncover the loot. The Merchant Alliance wants you as its pirate postal service, delivering items from point A to point B within a specific time limit. 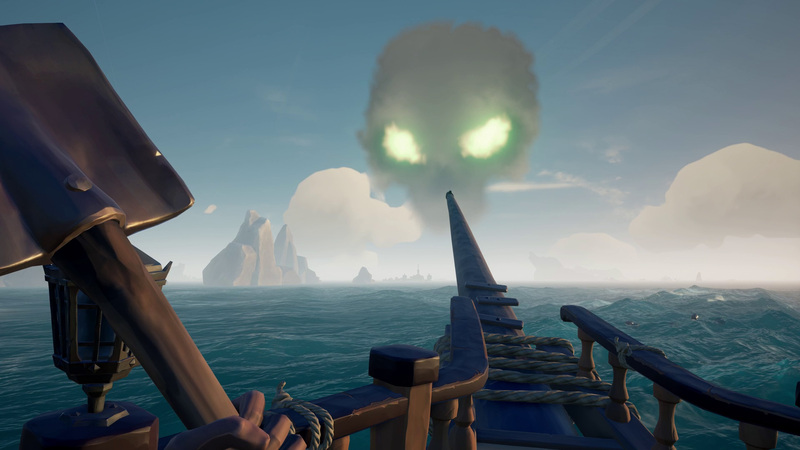 Finally, the Order of Souls pits your crew against hordes of skeletons on island strongholds; your target is the captain with a glowing skull. In all cases, you usually obtain an item that needs to be taken back to an outpost in order for you to profit. 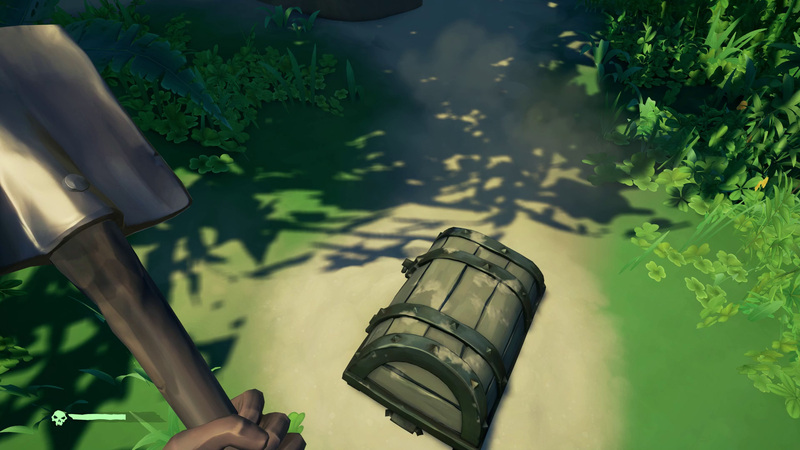 Gold Hoarder voyages have treasure chests and the Merchant Alliance has your cargo. 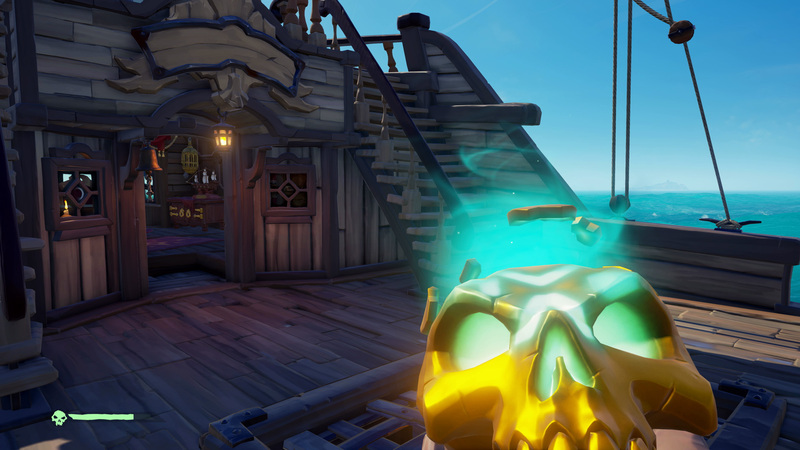 Order of Souls require the glowing skulls, which light up your ship like a beacon unless they're stored below deck. Bring the item back, and you'll get spoils in the form of gold and a bit of reputation with that particular faction. Shopping is just one form of progression in the game. Sea of Thieves lacks a rigid form of progression. Currently, you do stuff to get gold, which you then use to buy customization for your pirate and ship. 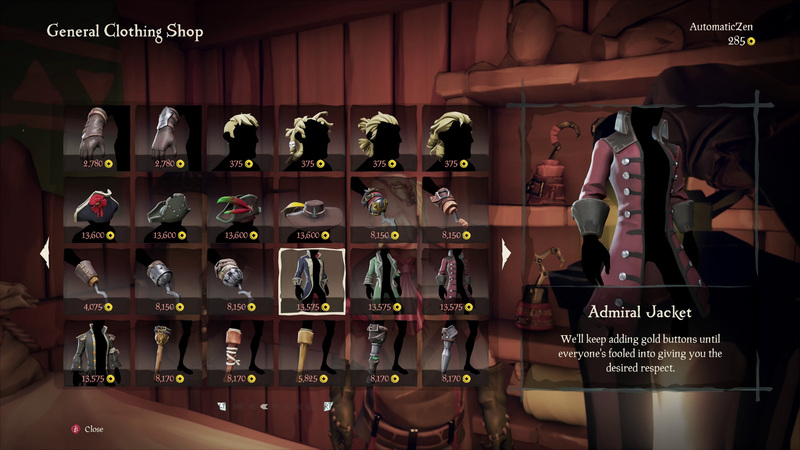 Shops at outposts include a wide variety of hairstyles, coats, shirts, peg legs, and more for your chosen pirate—you can't actually make a pirate from scratch, the game just randomly generates a few for you to choose from—and hulls, sails, and other cool objects to make your ship a fearsome devil of the sea. Most of the items just require you to grind out enough gold to purchase it, while some are locked behind specific reputation levels with the three factions. I am surprised that customization isn't more open: coats and shirts have specific colors and you can't paint your ship or sails, you just purchase existing options. Sea of Thieves is surprisingly freeform otherwise. Voyages are a structured form of play, but you don't really need to be tied to them. You can sail the ocean in any direction your choose and wander around the various islands. 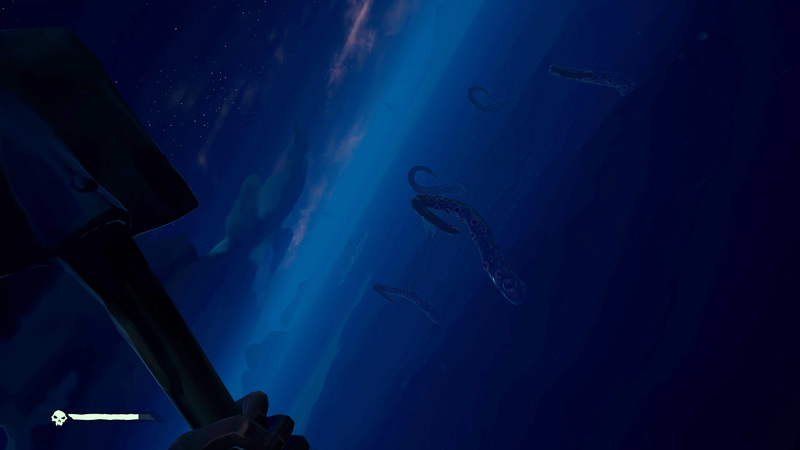 There's treasure not tied to certain voyages, there are harder islands marked by special skull-shaped stormclouds, and there's the kraken hiding in the depths of the sea. (It's actually just random tentacles, according to some players.) If you want to get drunk, you can just sit in a tavern or your ship's hold drinking grog. One game I joined was just three other people playing sea shanties on their instruments. It's a game built to allow players to join up with friends and just… relax. They can just sail, or fight hordes of skeletons. In a crew, voyages are voted on so you have a chance to find a consensus. And I'll be damned if Rare isn't doing something beautiful with Unreal Engine. The ocean is gorgeous and especially at sunrise or sunset it's a marvel to look at. The islands are all lush flora in bright greens and reds and the lighting is great, especially since lanterns are key for exploration into caves. All this assumes you have a good crew though. 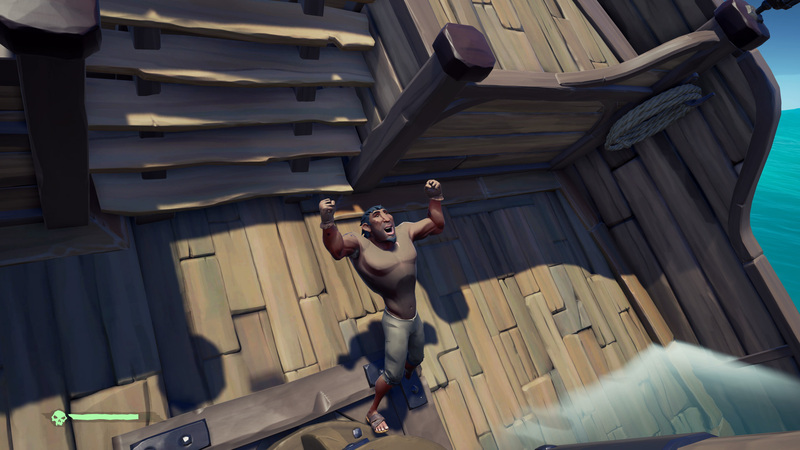 Unfortunately, if you don't have friends that are playing when you are, Sea of Thieves can fail apart real quickly. One game I joined was full of non-English speakers; we were able to get by for a time, but complex commands and ship-to-ship combat was damned near impossible without a common language. In another, I was immediately confined to the brig, because they were waiting for a third member. One game I joined was obviously in the midst of a failed voyage. I just sat on the ship, wondering where the rest of the crew was. 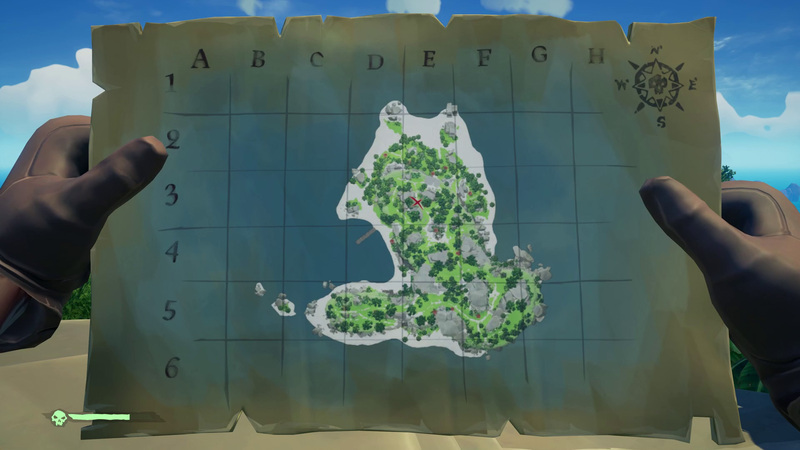 Sea of Thieves is a game that needs 2-4 people pointed roughly in the same direction. Without it, the game devolves into chaos and nonsense. Even simple actions like moving the ship are impossible if one or two of your crew wants to do something else or is just trolling. That's when you can even find a crew. Earlier play was fine, but when I tried to connect with friends later, I was unable to hear them in voice chat. Even later than that, the network issues started to rear its ugly head and I was unable to matchmake at all. Instead, I had sail out alone, which ended up being an unsatisfying experience. Sailing a ship alone is tedious, and complex maneuvers are hard to pull off. 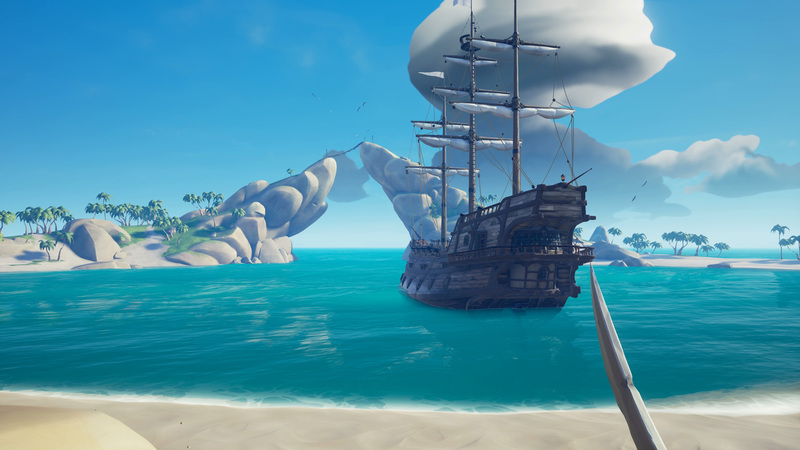 A spent a good 30 minutes trying to get a chest off of an island because I couldn't sail the ship close enough, anchor, take care of the single cannon aimed my way, and keep the ship afloat with repairs by myself. Are you a bad enough dude to brave the skeleton fortress? Sea of Thieves is also a game where a lot of work can end up coming to nothing. Player-vs-player combat is always on, and when ships are dueling it out on equal footing, the concept is a sound one. Two crews working against one another in an experience that's part chase, part trade of cannon fire, part sword-to-sword combat on an enemy's deck; that's great. But even a day in, griefers already exist. Some crews will just camp an outpost. Getting treasure chests or skulls isn't easy; doing anything in Sea of Thieves is a very time-consuming process. Since you have to bring all of your items back to outpost in order to gain your winnings, some crews have found the easiest way to proceed is just wait for another crew to return, kill them, and take their stuff. Spending an hour on a voyage only to lose everything is deeply unsatisfying. Sanctuary outposts aren't sanctuaries, they're killing fields. That's been my time with Sea of Thieves so far. It's feast or famine. At its best, it's like a pirate role-playing adventure. At its worst, it's tedium and trolling; hopping from game-to-game in the hopes that you'll find a solid crew while you wait for your friends to get online. Matchmaking is key in Sea of Thieves. Without it, you have almost nothing. If you're planning to go it alone, I'd say it's probably better to take a wait-and-see approach on Sea of Thieves at the moment. Does X really mark the spot? All that are my early impressions of Sea of Thieves from my first two days of play. I'll be updating this review-in-progress later this week with something approaching final thoughts. It's time to wrap this review up and I find myself torn on Sea of Thieves. On one hand, it frustrates me. There's no tutorial, which is fine early on in the process or if you end up with a kindly person in matchmaking, but a week in, you can already start to see players unwilling to explain basic stuff to new folks. It relies heavily on the community teaching new players, which is an uneven experience to say the least. Even a glossary explaining basic systems would've been somewhat helpful. Speaking of matchmaking, the game relies entirely on a group of like-minded individuals, more so than any game in recently memory. (You don't even need to speak the same language in say, Vermintide 2.) This doesn't have to come from a group of existing friends, but Sea of Thieves is a winner when you do have a tight-knit crew coming up with silly nonsense on the fly. One man floating helplessly above a sea of kraken tentacles. This was a bug. You can get by on the luck of the draw and it's landed me in some interesting places. I ended up in one solid group with a duo of high-school aged kids, who were busy talking about local school gossip in-between our seafaring exploits. In another, I landed with a group of folks closer to my age, including possibly the best helmsman I've seen so far. He had us weaving in and out of tight spaces like a champ and it was a pleasure to watch him work. But I've also ended up in groups where they're in the middle of a voyage with a broken ship and missing or bailing crew members, offering me complete lack of understanding of what's going on. One group just wanted to throw each other in the brig for giggles. In some, the language barrier has been high, while others haven't had a microphone at all. When you're with a good crew, it's smooth sailing. 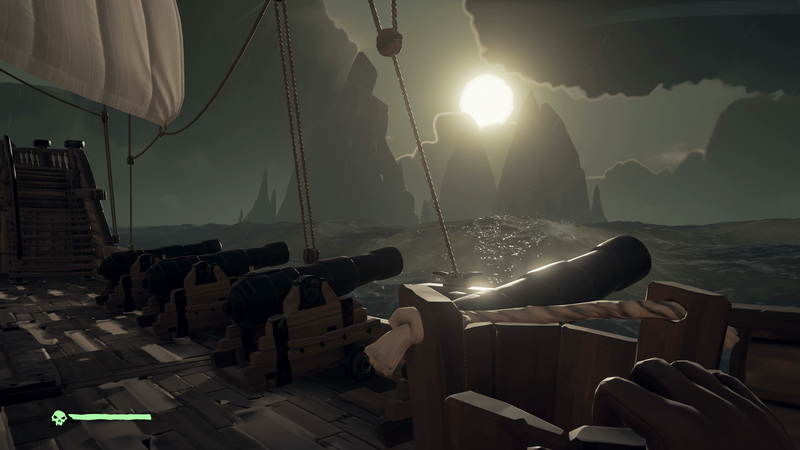 When you're with a bad crew, you can see the sun-bleached bones of Sea of Thieves. The Voyages can be slight and repetitive at times. The core of many don't really rise to the occasion, though the puzzle-centric Voyages where you have to figure out Treasure Chest locations from context clues are a highlight. There are two real enemies in the game: skeletons and snakes. Combat difficulty is down to more skeletons and hardier skeletons. The kraken is currently just an encounter; it stops you, attempts to eat your crew, and you hurt it enough to send it away. The skull that the Order of Souls has... ordered. Progression is almost entirely flat: from a systems perspective, you're as good at Sea of Thieves on day one as you will be one day 100. Completing Voyages and turning in loot gets you gold and improves your reputation, allowing you to by new weapons, coats, and other stuff, but none of it makes you any better at the game. 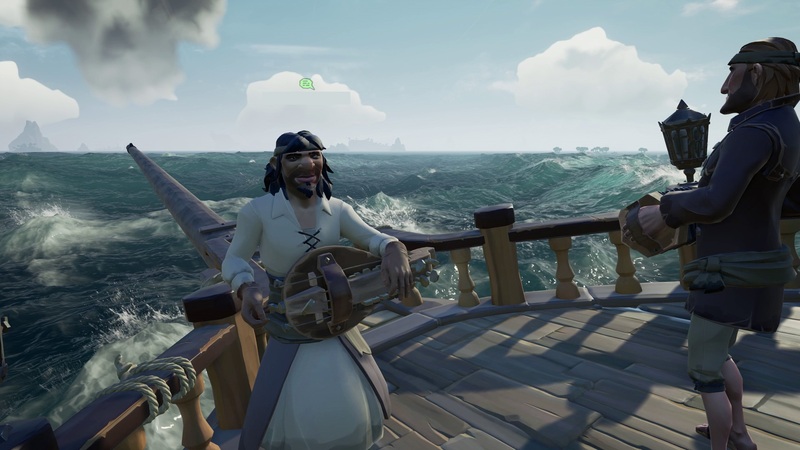 There might be a coat or peg leg you have your eye on, but once you've picked that up, you're mostly just raising rep with the three factions (eventually more) and grinding your way to Pirate Legend. Speaking on customization, Sea of Thieves falls puzzlingly short in this respect. The pirate generator seems to be a poor replacement for actually being able to create your own pirate from a list of choices. Color options for purchased gear and ship parts, or an emblem creator of some sort (akin to the Forza game) would go a long way towards making your character and ship feel like they're really yours. On the other hand, there are those perfect moments. Rare's art team deserves a full round of cheers for their work in Sea of Thieves. There are moments where you'll just stop and marvel at the landscape stretching out in front of you. Sunset as your ship approaches an island. The quiet, ethereal fog and shattered remains of life in some of the island caves.The wave simulation is damn near the best seen in any game ever; you notice the way light bounces off it just right, regardless of calm waters and tumultuous storms. Occasionally, when nothing is happening, you'll just stop, look out from the deck of your ship and go, "Wow". There's tension and excitement out there in the ocean. In one instance, my current crew had our ship rammed while we were island diving. The opposing crew's ship didn't survive the encounter, with both ships going down. We retrieved our existing treasure and then two of us teleported to our renewed ship. The problem is we forgot which island we were on. That led to 20 minutes of calling out landmarks and whatnot to figure out which island we needed to return to before the enemy crew did the same. Once we finally got there and sailed away with our spoils, there was dancing and drinks to be had back at the outpost. A pirate should go down with his or her ship. In another instance, my entire group was fighting a Skeleton Captain for an Order of Souls voyage and then a storm rolled in. This meant I had to book it back to our ship and bail out the water collecting below deck to keep our already rickety ship from sinking. The act of ship maintenance alone is great: when I hear that telltale groan of a ship running against something, I'm already primed to grab some wooden planks, patch the hull, and begin the water bucket trek. As I noted before, PVP can be horribly annoying if we're talking about outpost campers, but random combat on the high seas is still top notch. In one instance, my crew shut off all our lanterns at night and crept up on an enemy ship to steal their treasure silently. (It didn't work.) Ship-to-ship combat between two galleons is a great experience, with two crews of four attempting to work together to to overcome the other. Hairpin anchor turns, shooting yourself out of a cannon, and using islands as cover are strategies that could help or doom you. 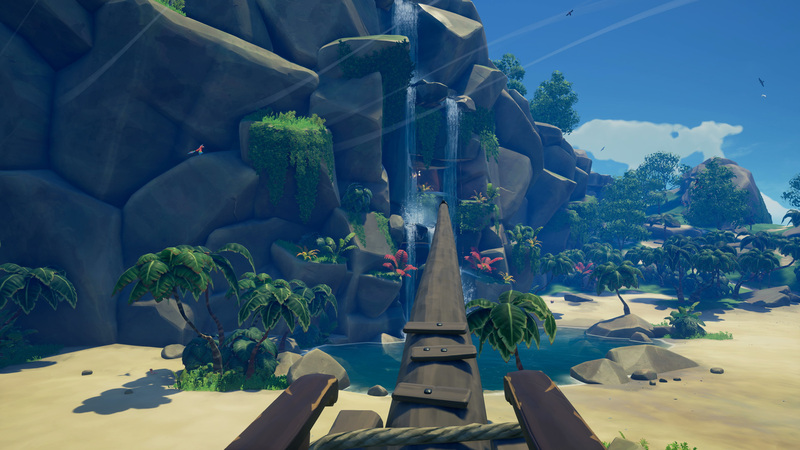 There's also some intensely calm spots in Sea of Thieves. The slow roll of ship under the control of great crew? It just feels really good. I can't deny that the game offers those moments to players who are willing to stick with it. Right now though, Sea of Thieves feels like a very pretty interactive chat room. Get some friends together and have a couple of pirate adventures. Drink some grog, loot some islands, shoot cannonballs at other ships, and then call it a night. Half of my best Sea of Thieves experiences have been spent talking about stuff outside of the game itself. It's a game that prizes conversation and communication over gear and skills. I'd just like it to be a more consistent experience and one with more chances to show off player personality. I'm not done with the game, but I'm not completely rushing back to it each night either. There's the niggling feeling that there should be more here. More islands, more factions, more customization. Maybe in a few years, there will be. Rainbow Six Siege is king of the castle two years after a disappointing launch. Sea of Thieves is also a service game and Rare wants to add to it for years to come; I hope the studio gets that chance. If you are jumping into Sea of Thieves, hold on a minute. You're going to want to read through our Sea of Thieves hints, tips, and guides first. Learn how to make lots of money, customize your ship, and take on the Kraken before it makes seafood out of you. Sea of Thieves is a feast or a famine. When you're playing with friends, it's an enjoyable voyage across a beautiful ocean, finding buried treasure and getting into trouble. When your group isn't up to snuff, you can find yourself lost, bored, and confused. There are highlights to the experience, but I wish it was a more consistent one and there were more opportunities in terms of player customization. After a year or two, I think Sea of Thieves might be a complete winner. Right now, it's uneven. Tagged with Microsoft,	Reviews,	Xbox One.